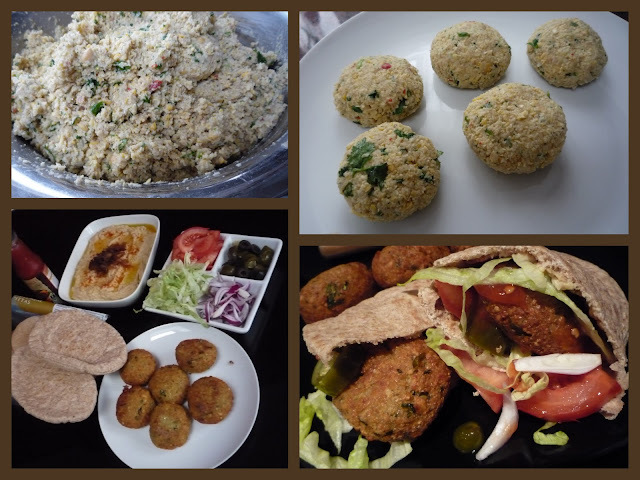 Jagruti's Cooking Odyssey: Keep Smiling you are on youtube :) - Falafel in Pitta bread ! Keep Smiling you are on youtube :) - Falafel in Pitta bread ! Happy Birthday to you ! I hope you had an amazing Birthday ! Age is only a number so don't worry because to me you are always the same....My very kindly, always Happy and caring Aunty :)....Thanks for always making sure that Hayley has a smile on her face ! I'm sure she makes you smile too..It's your birthday so I hope this card makes you put on a bigger smile..You're beautiful just like Hayley and hopefully one day we can meet again and have a good chat...Once again HAPPY BIRTHDAY...and Keep Smiling :)) ! 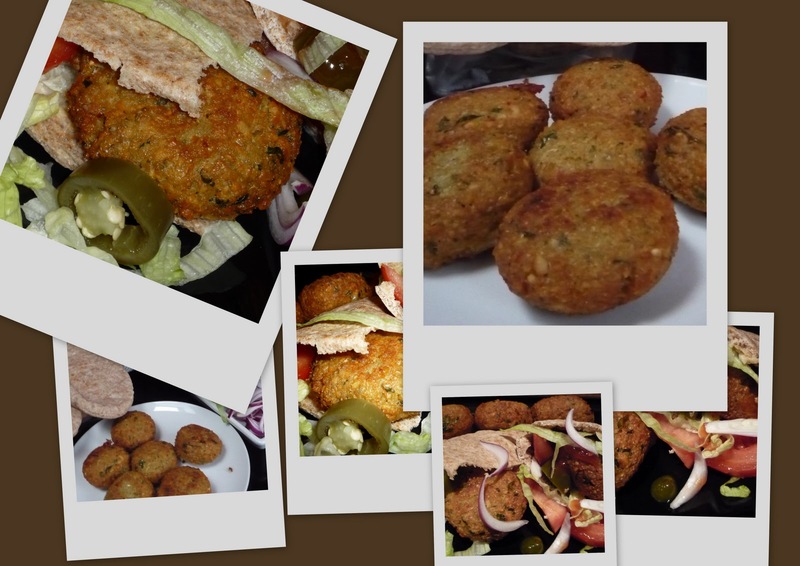 Falafel ( /fəˈlɑːfəl/; Arabic: فلافل‎, i /falāfil/) is a ball or patty made from ground chickpeas and/or fava beans. Falafel is usually served in a pita, which acts as a pocket, or wrapped in a flatbread known as lafa. The falafel balls are topped with salads, pickled vegetables and hot sauce, and drizzled with tahini-based sauces. Falafel balls may also be eaten alone as a snack or served as part of a meze. Drain, rinsed and dry soaked chickpeas. Place chickpeas in food processor with all the ingredients except oil. grind them to a coarse paste. Mix well and form the mixture into balls, slightly flatten, place on a tray, cover and refrigerate for about half an hour. Deep fry them on a medium to low heat until golden brown. It will take about 7-8 minutes. Fry falafel in batches. Remove with a slotted spoon and drain them on a kitchen towel to remove access oil. Falafel are ready to serve on it's own or you can be used in sandwich. hey guys if you remember I recorded two cookery TV shows here in London, they were aired in December and now available on You tube to watch..here is the link, altogether there are 4 clips to watch...please watch and give me your feedback...thanks ! as for the videos....too good....I think now u should start making videos for all ur cooking...what say! Wow thats really great to see ur videos..Falafel are always my favourite,tempting.. Wonderful post..congarts on your tvshow..Watched all the videos and they are really good. Hope to see many more from you.. The poem is vey touching..Falafal looks so delicious..My fav. Slurp, such a drool worthy and tempting pitta bread,inviting.. Wonderful post,love ur cooking videos,anazing!As smitha said u can start making video for cooking. Falafel in pita bread looks yummy and refreshing.Cool videos. A nice video! And falafel looks very delicious. Wow!!! Just saw your videos...you rock girl :-) Keep up the great work. Falafels are my fav, they look yummy! Love your recipe for falafels. Such a lovely dish to enjoy at any time. What a cute card! The falafel looks super delicious! The music playing makes me feel like I went out to eat dinner :P Oh, and congratulations on the videos!